The topic of the second volume of the series in "Essentials in Ophthalmology" is cataract and refractive surgery, a realm of ophthalmic care that has undergone revolutionary changes in the past 10 years. Worldwide, the removal of the opaque crystalline lens is the most frequently performed surgical intervention in the human body, and refractive surgery encompasses an increasing array of procedures with rapidly growing surgical volumes. The goal of the editors of this book has been to provide up-to-date clinically relevant overviews and to highlight the most interesting fields of research and controversy. 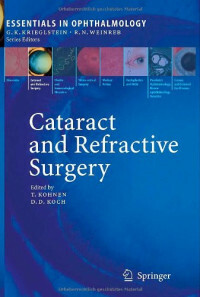 The first half of the book focuses on new cataract surgical techniques and devices, including topical anaesthesia, small incision cataract surgery, modern intraocular lenses and ophthalmic viscosurgical devices. Special attention is devoted to difficult situations, such as mature, uveitic and pediatric cataracts, and to the prevention and management of complications. The second half of the book describes current and evolving modalities - both corneal and lenticular - to correct human refractive errors. Particular emphasis is placed on topics related to quality of vision, such as wavefront technology, measuring quality of vision, and issues in pupil measurement. Many of these topics pertain also to cataract surgery, indicating the merging of technologies that is occurring in these two major ophthalmic subspecialties. Offering new services is a great way for your organization to drive traffic and boost revenue, and what better foundation for these services than IP? This much is a given. The difficulty is uniting business and technical perspectives in a cohesive development and deployment process. Distributed and communicating objects are becoming ubiquitous. In global, Grid and Peer-to-Peer computing environments, extensive use is made of objects interacting through method calls. So far, no general formalism has been proposed for the foundation of such systems.